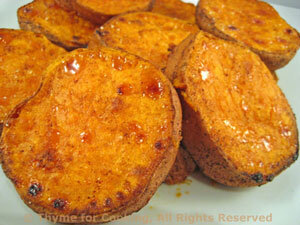 Sweet Potato Oven Chips, Thyme for Cooking sweet, healthy side dish. Paprika works well with sweet potatoes, adding a little zing. Use hot paprika if you like. Slice potatoes into rounds, about 1/4 inch (1cm) thick. Put oil and paprika into a large bowl, add potatoes and toss, coating thoroughly. Arrange potatoes on baking sheet with rim (I use my trusty, round pizza pan). Bake at 400F for 30 minutes, turning once if you like. When done remove from pan and sprinkle lightly with salt and pepper if you choose and serve.